Heat oven to 350ºF. Grease 2 (8x4-inch) loaf pans with shortening or cooking spray. In large bowl, beat brown sugar and butter with electric mixer on medium speed until light and fluffy. Add eggs; beat well. In small bowl, stir molasses, water and baking soda until well mixed; beat into brown sugar mixture. Gradually stir in flour and remaining bread ingredients until well blended. Spoon batter evenly into pans. Bake 50 to 60 minutes or until toothpick inserted in centre comes out clean. Cool in pans on cooling rack 15 minutes; remove from pans. Cool completely, about 1 hour 15 minutes. In small bowl, stir together icing sugar and enough lemon juice for desired consistency. Brush glaze over cooled loaves. Wrap tightly and store in refrigerator. 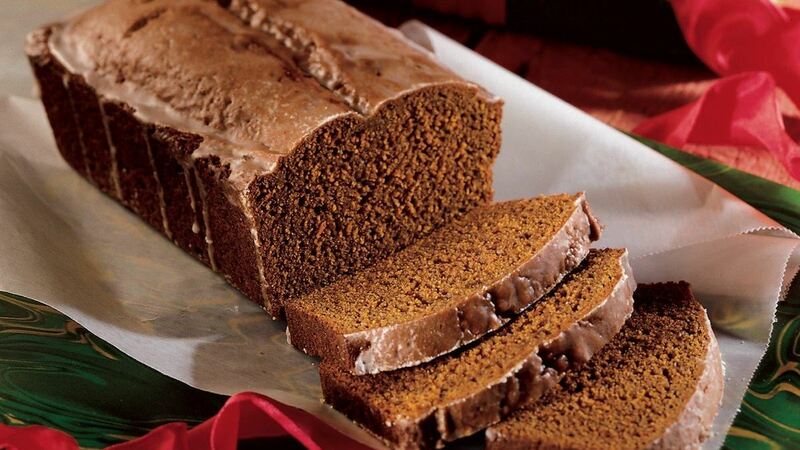 Cook's Note: Gingerbread has been a holiday specialty for centuries. During the middle ages, ladies presented this spiced bread to dashing knights going into tournament battle. Gift Idea: Since this recipe makes two loaves, your family can enjoy one and the other can be given as a gift. Cover the loaf with plastic wrap, then wrap with decorative paper and a bright bow.